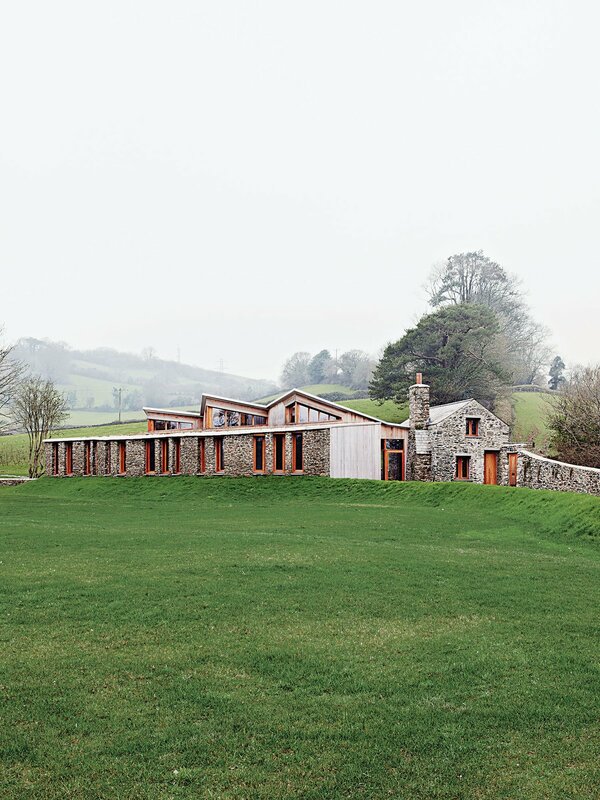 In southwestern England, an architect transforms a former postman’s cottage on a sprawling estate into a home that radiates from its original foundations. When Hugo Day hired architect David Sheppard to create a traditional home on his family’s 600-acre estate along the River Erme in Devon County, England, the original plan was to demolish a small stone outbuilding on the property. Thanks to a disused local quarry, the architects were able to apply the same mix of granite and limestone used on the cottage’s exterior walls throughout the addition. The resulting 2,497-square-foot residence remains congruous with its roots: Stone walls mimic traditional property boundaries, and the roofline references the original structure.